posts under in NHM Department. There are total 25 vacancies available in this Kerala PSC Recruitment 2017. Eligible candidates are suggested to submit their applicaiton form toNHM Malappuram District on or before 20/05/2017 in prescribed proforma along with necessary docuemnts. Selection will be based on marks in qualifications, Interview or Written Test. See the below given details for No of vacancies, Age limits, Selection process, qualifications and Application process of Kerala NHM Malappuram general recruitment examination notification. Click here to see the official notice of NHM Malapuram Recruitment. Post Name: Junior Public Health Nurse GR- II-25 Posts. Pay Scale for the post of Jr. Health Nurse is Rs.11620/-. Candidates must have passed SSLC or its equivalent qualification. For detailed qualification details see the official notification. Candidates applying for NHM Malappuram Recruitment will be shortlisted based on Written Test/ OMR/ Online Test or throuhg merit in Educational qualificaiton. Interested/ Eligible candidates are suggested to download the application form from oficial website of NHM Kerala @wwwarogyakeralam.gov.in on before the closing date of 20-05-2017. Along with application form attach all educational certificate copies of self attested, ID and address proof, DOB certificate, registartin certificate and if any other related documents. 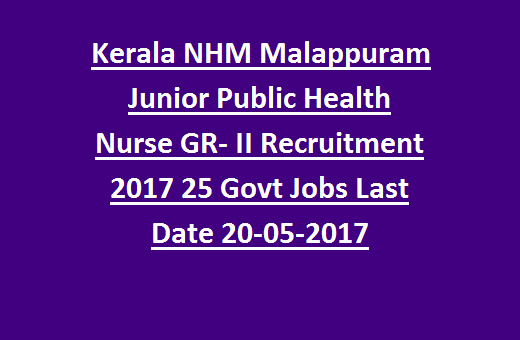 Click here to download application form and notification for the NHM Malappuram Junior Public Health Nurse Jobs Recruitment 2017. 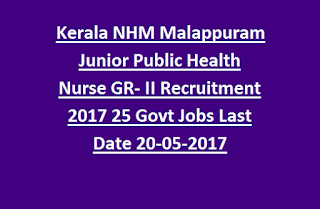 Please share this NHM Malappuram Nurse Recruitment Examination 2017 article to your friends via social web sites.